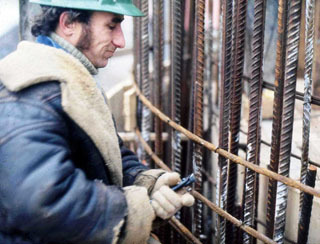 On May 29th 1975 the building of the TVIND Turbine began. Read below, about the men and women, who made it possible. With the one MegaWatt Tvind Turbine, they showed that it was possible for ordinary people to establish alternatives to nuclear power and fossil fuels. Thousands of interested people visited Tvind in the building period from may 1975 through march 1978 and further on, when the turbine was producing electricity. Today - 30 years later, the Turbine still operates. Many selfbuilders were helped by "Vestjydsk Energikontor" at Tvind. This office, giving free support to sellfbuilders and other. Much advise was given, in connection with the small 15 kW PTG turbine designed by the people of Vestjydsk Energikontor. Learn more of this below. The importance of the building of the Tvind Turbine was immenmse - at a crucial time in history, where Denmark was going to decide, whether we should embark on building nuclear power stations in the country, or not. The Foundation and the 53 meter highTower was made of reinforced concrete. The nacelle, housing for gearbox, synchroneous generator and the hydraulic pitch- and emergency stop system, was a welded steel construction. Most of the volunteers had never seen a welder before, but learned the art from other members of the Wind Turbine Crew, learning by doing. The Blades were constructed in fibre glass reinforced epoxy. Before the blade project was started, 3 fishing boats were fabricated by the crew, in order to learn working with composite materials. Although the turbine was to use pitch control, an aerodynamic safety system, in the form of tip-parachutes were also built into the construction. Hoisting of the blades was done with the assistance of Klose Kraner (Klose Cranes from nearby city Holstebro). 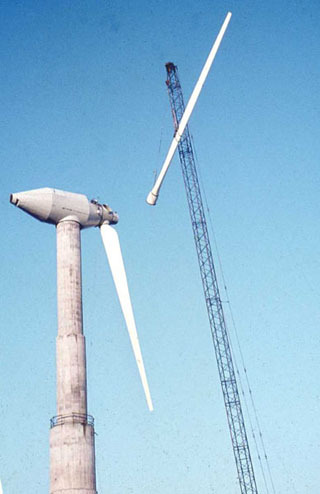 Klose later became the major crane company for erecting turbines all over Denmark, when a Wind industry matured only 5 years later and more than 3500 turbines was erected for the next 20 years. 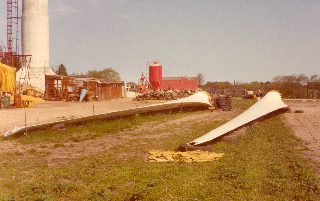 On March 26th in 1978, the Turbine was starting operation. 30 years after, it still operates. The Wind Turbine Crew, and the external experts. The so called TVIND-Schools were initiated in 1972 by a group of teachers lead by charismatic teacher Amdi Petersen. Soon a cluster of small schools were established in the area west of Holstebro in west Jutland, Denmark. The schools all focused on a combination of thearetical and practical work or "learning by doing". 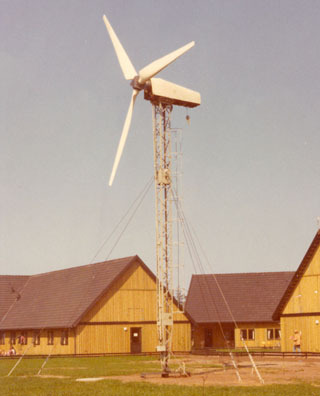 After the 1973 oil crisis the Tvind Schools wanted to establish an independent energy production for themselves, and to set an example to avoid the implementation of nuclear power stations in Denmark. They chose to build a Megawatt Wind Turbine, and advertized in nationwide newspapers for crew members ("Møllebyggere") to the Turbine Crew. Most of the crew were volunteers, and a few later became part of the Tvind organisation. Some of the members are now - 30 years later - valuable employees in the Danish wind Turbine Industry. This happened shortly after 1968, where many young people did not think much of their privat progress in making money, but often wanted to volunteer "for a better world". Non profit Environmental movements as Friends of The Earth and Greenpeace were established in those years. At first they visited the world famous German professor Ulrich Hütter at his institute in Stuttgart. This is probably the reason who the turbine was designed as a down wind turbine, despite of the successfull Danish Gedser turbine design. But first and foremost the blade design was influenced by Hütter, including the vulnerable Hütter blade root system. In the aerodynamical and structural blade design, the young engineers of Tvind had good help of RISØ's Grand old man in aerodynamics Mr. Helge Petersen, and also Peter Steen Andersen and Per Lundsager. For the tower design Ingeneer Hans Lundgaard Laursen, Beder helped the team. 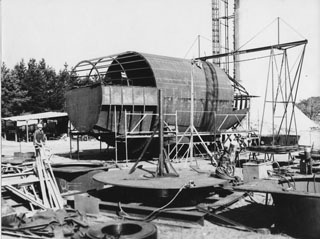 The nacelle design was assisted by Lars Svanborg, who ran the engineering design and construction company "Idé Smeden" at Ravnstrup near Viborg. For the design of the electric control and frequency inverter system, professor Ulrik Krabbe of the Technical University of Copenhagen helped, and also engaged a crew of students to design and build part of the electric systems. Another crucuial factor was the disciplin amongst the turbine builders. The volunteers were typically young anti authoritarian people. But they wanted to make a difference in creating a greener world, so they accepted a very stringent disciplin at the wind turbine crew. Many hard working hours and sometimes very little sleeping and rest. They all struggled hard towards the common goal and they did not make any money for themselves in the building period. Volunteers from Denmark and the World made it happen. In the building period from May 29th 1975 to March 26th 1978, reports in the shape of booklets were published, to inform the public on the spectacular and impressive project. Along with the building of the Tvind Turbine, Vestjydsk Energi Kontor was established in 1976. Main forces of this office were two talented young engineers, Jens B. Gjerding and Søren Kahlke. Many selfbuilders came to Tvind to see the building of the Megawatt turbine, but also to have valuable advice from the young engineers at Vestjydsk Energi Kontor. They designed the PTG Turbine, and the blades for that turbine. (PTG is abbrevation for Praktisk Teoretisk Grundkursus, meaning Practical Teroetic Basic course - Thus the PTG Turbine was build by a crew of students at one of these courses). Vestjydsk Energi Kontor had humble premises.